People remembering the 1970s as a grim decade must surely be forgetting records like this, which prove that it was also a time of romance and sophistication. Romance of course meaning “French”. And sophistication meaning….”French”. And they don’t come much more romantic and sophisticated than Charles Aznavour. “She”‘s lyrics take a somewhat easy road – womankind as an exotic, unknowable, endlessly mysterious other. Men are from France, women are from Venus. You don’t get much sense that “She” is a real human being, which is of course the point – this record is both all-purpose (who wouldn’t imagine they were flattering their lover by implying that she is She) and aspirational (but actually it’s probably Brigitte Bardot or someone). Under the heavily-accented corn there’s a song here somewhere but I can’t say I have the patience to uncover it. This spate of Francophilia came at around the same time as the Cointreau adverts. You know the one – woman at dinner party asks French guest, “What is Cointreau?” Frenchman reads the label:“Inimitable chef d’oeuvre – litairallee a mastairpiece zat cannot be equalled” etc etc. French entertainers such as Sacha Distel and Mireille Mathieu were on our screens a fair amount. And we weren’t too far away from a referendum in which there was a bigger vote in favour of the EC than you might expect today. Perhaps we just liked them more than we do now! “Waldo, you are a clever and creative boy but your imagination tells me that there is something disturbing in you…” Charming. When I returned to my class, I had it on good authority that I would broadly be left to my own devices and not subjected to any cruelty. Amazingly this held sway. I think the advent of the exam season had much to do with it and I was, after all, in the “O-level stream”, largely a civilised group within a school choc-full of psychotics, neurotics, bullies, nincompoops, half-wits and violent basket cases (and that was just the girls). 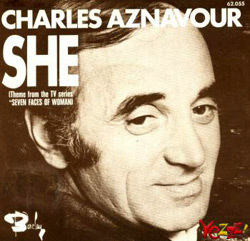 Everything was going swimmingly until “She” by Charles Aznavour charted and very quickly occupied the top spot. Universally this record was loathed by my contemporaries, boy and girl, but I personally thought it was a beautiful song and said so, even though it was the theme to a Frank Finlay-esque TV series no bugger ever watched. I particularly liked the line about “beauty/beast, famine/feast”. I said this openly too. It was only after this happened that I walked into class after lunch one day and saw that somebody had scrawled “WALDO IS CRACKERS!” on the blackboard. I had my own idea as to the culprit but it wasn’t important. What was important was that someone had obviously considered my fondness for a pop ballad as a clearer sign of lunacy than my drowning-the-pets story, which even I later conceded was a worrying piece of prose, the consequent psychoanalysis of the thirteen year-old author being perfectly understandable. Thank God I’m cured now. I would have thought ‘Crackers’ was a fairly mild taunt even for thirteen year olds. I can see their point though. Although these days, “Boxing Day Bobby” would not only be published but earn you a slot on Channel 4. Dr Ganges????? Surely too much of a coincidence on the Pooh Sticks tip. I look forward to Charlie Brooker recycling Waldo’s story as his own idea in next Saturday’s Guide. “Boxing Day Bobby” occupied all of three and a half pages of a red A5 exercise book. At the bottom was the comment from my teacher: “See Me”. The spooky thing was I can’t recall my parents having anything to do with my consequent sessions with Doctor Gangees, although I consider it unthinkable that they would not have been consulted to see whether there were any objections to my treatment. As for the story itself, Charlie Brooker and/or Channel 4 are quite welcome to it. Ah yes, the good old, intimidating “See me” in red ink. Quite a popular writing theme in my own West Central Scotland schooldays actually, although kittens etc. would have been replaced by “Catholics” or “Protestants” being given the Pooh Sticks treatment, depending on which school you went to (woe betide you in certain parts of Lanarkshire if you had a blue exercise book). I must confess that “See me” appeared more than just the once as a mark for my English compositions or “stories” as the thick kids called them. Far more satisfying was a comment regarding a piece I wrote about a swimming pool, comparing this to the Berlin Wall. I was very pleased with it and the teacher’s remark was “Good if original”. The implication was obvious and when I showed this to my dear old mum, she was livid and ready to steam round to the school to confront the teacher. I assured her that the comment was the most flattering thing he could have written and that his opinion didn’t matter. If he felt that the work was beyond my wit (I was only a scumbag comprehensive school kid after all), it was completely up to him. My mum could never see this but a face-off with the school was fortunately avoided. Can anyone remember who the hunk was in the old Cointreau advert? He had a lovely way of saying ‘ora-nggges’!! Google says it was one Christian Toma. I discovered this through the EC cover and I think it’s a pretty perfect song. Nice to see it’s polarizing people… great songs probably should. Buen cantante con buena sensibilidad, que dejara un buen legado. RIP to Charles Aznavour. 94 which isn’t a bad old age, and he seems to have been fit and cheerful up to the sudden end. Worse ways to go. A birth year of 1924 may well have made him the third oldest living UK number one hitmaker at the time of his death (behind Vera Lynn and Doris Day – there may be advances).